Ariel Lawhon is the author of The Wife, the Maid, and the Mistress and cofounder of the popular Web site SheReads.org. She lives in the rolling hills outside Nashville, Tennessee, with her husband, four sons, and black Lab—who is, thankfully, a girl. "Lawhon deftly braids together the complex threads of her characters' stories, narrating via a keenly observed third-person voice. Her taut prose and subtle plotting create a gripping narrative, rich with historical detail and spiked with plenty of surprises even for those who know the Hindenburg's fate. Through her vividly drawn characters, Lawhon's story touches on grief, family loyalty, ambition, romance and complicated international politics. Like the spectators who observed the Hindenburg's fiery descent, readers will find themselves unable to look away." "Flight of Dreams melds historical fiction, a touch of romance and mystery to create a tale that becomes more difficult to put down as the disaster draws near." "Ariel Lawhon has real vision and the writing chops to back it up. She weaves the voices and lives of the Hindenburg's doomed--and surviving--passengers together in intricate fashion, linking them at startling intersections that bind them into a single, riveting tale. It's a fascinating blend of love and murder, big dreams and betrayal, history and pure imagination--I could not put it down." "Flight of Dreams enthralls, taking the reader on the doomed last flight of the Hindenburg with a story so vivid, it is impossible to pull away. Mystery, romance – it is all here, told in a mesmerizing tale." 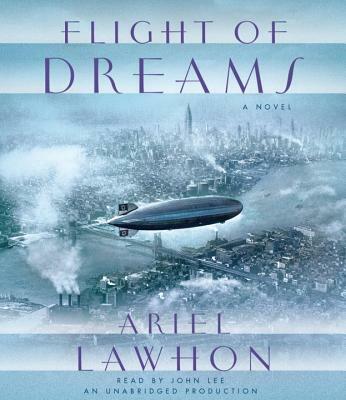 "In Flight of Dreams, Ariel Lawhon masterfully re-imagines the infamous Hindenburg tragedy in uniquely human terms, and the result is a spectacular page-turner of class and distinction. Intricately plotted and deftly characterized, this beautifully written novel is wonderfully satisfying - historical fiction at its best." "A magnificent, tour-de-force story, FLIGHT OF DREAMS will break your heart and satisfy every conspiracy theorist who’s wondered what really happened to the Hindenburg.Simply spectacular—I've never read anything like it. Lawhon has written the book of the year. She’s a writer to watch—now, and for many years to come." "[A] wonderfully suspenseful, heart-wrenching account...[Lawhon's] vision for the journey and the cause of the explosion is masterful and humanizes the event and its aftermath. She has taken a story from history and re-imagined it into a magnificent novel." "Historical fiction at its best.... Even knowing the ending doesn’t diminish the suspense." "For her second outing, Lawhon once again reimagines a front-page news event, filling in the entertaining backstory with passion, secrets, and nail-biting suspense, this time taking on the disastrous crash of the Hindenburg in 1937...Lawhon threads many stories together, connecting passengers and crew and bringing behind-the-scenes depth and humanity to a great 20th-century tragedy—even though we all know theHindenburg’s fate." "An Agatha Christie–style page-turner...Building on a dense scaffolding of biographical and historical fact, Lawhon invents personalities and relationships for key passengers, chooses from the extant theories about what caused the fire, and spins it all into a web of airborne intrigue...As the disaster inches closer with every chapter—each begins with a countdown in days, hours, and minutes—Lawhon evokes the airborne luxury of the ship—the meals, the cocktails, the smoking room, and the service—in such detail that you end up feeling a little sad that the stately flight of the Hindenberg marked the end of passenger travel by airship forever. A clever, dramatic presentation of a tragic historical event. Suspenseful and fun."